Since I was first introduced to the healing process by Oracle Laura in December 2010 the things I’ve learned about myself from her is phenomenal. Through the psychic readings and tarot readings I also learned self reliance and emotional awareness. In the readings there was accurate depictions of my life as it was unfolding at that time of the readings. The accurate readings helped me with questions and answers I had before I even asked them and that’s how I’ve come to value the readings by her. Situations that only I would know about. It’s a relief knowing you’re not alone. I found that I have to trust the process. If I fight it then it wont work. My healer works through a gift she’s been given. Your mind is a powerful tool and if used correctly you can overcome even nightmares. I had what I thought was a sleep disorder. When I was about to get surgery on my nose, Oracle Laura had advised me of steps to take whenever I had a sleeping episode. Based on the information I gave her she had something to work with and she soon determined that these were panic attacks and that I could overcome them if I wanted to, allowing my mind to over-ride my system. A condition I had for years, ever since I was small, was gone. When I feel it coming on learnt behaviors had me reacting differently. She has helped me expand my thinking process so my solutions are now different. As a result it's allowed me to progress. Before January I had smoked 600 cigarettes a month but now as as a result of this solutions over-ride I now average 10 a month. I continue working with her as my healer. Today I don’t have to be alone. I don’t have to stay sick. It is giving me the courage and confidence to take on new challenges. The first direct positive result of not smoking was her suggestion to follow through on a new diet. I am diabetic but as a result of that change in a 4 month period my diabetes is now in remission. I haven’t had to take my diabetes medication in 3 months. This also gave me the courage to go off my stroke medication next and I am able to deal with the pain through other methods which I prefer. Positive energies and proper guidance is giving me my life back. 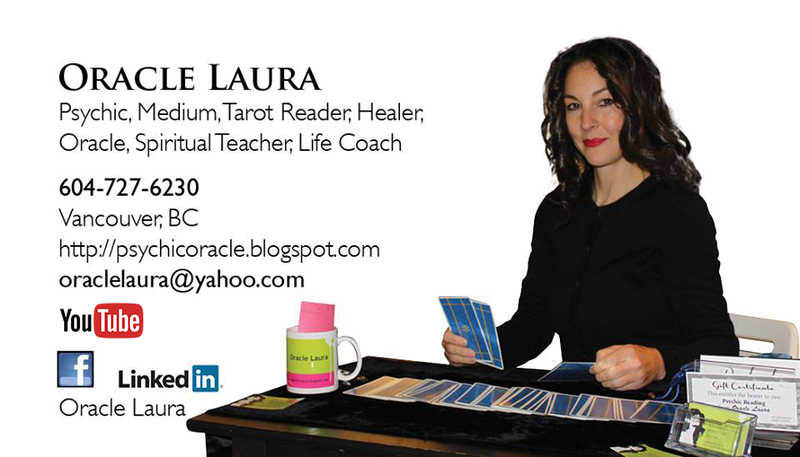 Copyright (c) October 26, 2010 Oracle Laura. Simple theme. Powered by Blogger.